Born in 1948, Sensei Hitoshi Kasuya graduated from the rigorous JKA specialist instructor’s training course in 1973. He was a student of Hosei University (Tokyo) where he distinguished himself in the University Karate Club as team captain. Kasuya Sensei excelled in these early years in the relatively new arena of sports (competition) karate. 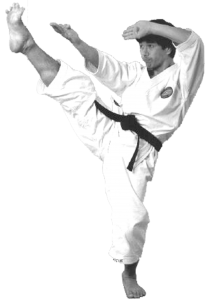 In 1975 he competed in the International Amateur Karate Federation (IAKF) 1st World Championships held in the USA where the Japanese team, of which Kasuya Sensei was a member, won 1st place in both kata (forms) and kumite (fighting). Kasuya Sensei repeated this feat with the Japanese team 2 years later when the World Championships where held in Japan. In 1980 and 1982, Kasuya Sensei competed in the WUKO (now WKF) World Championships and it was around this time he was reassessing his karate future. He learnt that his Sempai (senior) Kanazawa Sensei was leaving the JKA to form his own organsiation and so decided to join him and assist in establishing what was to become SKI (Shotokan Karate International). 1983 saw the 1st SKI World Championships in Japan and Kasuya Sensei competed and won 1st place in individual kata and 1st place in team kumite. 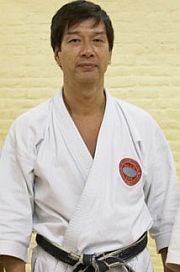 Similarly in 1985 at the 2nd SKI World Championships he won both individual kumite and team kumite. In 1990 Kasuya Sensei decided to establish his own organisation and hence WSKF (World Shotokan Karate-do Federation) was born. Initially the fledgling organsation only had a few member countries but due to the reputation of Kasuya Sensei, the group grew to a point where today it has over 90 member countries spread throughout Asia, Europe, the Middle East and Australia. Every two years the WSKF holds a major event in Tokyo Japan where all member countries can come together for an international training seminar and compete in the World Shotokan Karate-do Federation world championships. As Chief Instructor of WSKF, Sensei Hitoshi Kasuya spends a good part of his time travelling to member countries to conduct training seminars. His teaching combines an analytical approach with an underlying Budo attitude. Whilst maintaining an emphasis on traditional Shotokan techniques, Kasuya Sensei has infused his style with a unique system of rotational dynamics that takes WSKF karate to a level never seen before in mainstream Shotokan Karate and to this day his philosophy and contemporary attitude inspires generation after generation of karate-ka.